The Gear S2 smartwatch uses the preinstalled Samsung keyboard by default. You can, however, download third-party keyboards from the Galaxy Apps store on your smartphone. You’ll likely find the Samsung keyboard to be plenty good enough, plus it comes with a number of options that you can change. To see those options, tap Input in the Connections options screen. In the Input options screen that appears, tap Keyboard Settings. Within the Keyboard Settings screen, tap Samsung Keyboard. Now you can view all six Samsung Keyboard options in the Samsung Keyboard options screen, shown here. Swipe up and down to view all options in the Samsung Keyboard options screen. When you type information, you see the default row/column keyboard layout that’s similar to what you find on a smartphone dial pad. Tap English (US) to change between the default row/column layout and a rotary keyboard layout where the letter and number keys are located around the periphery of the screen. You can select one or more languages from the list so that you can type special characters that are unique to a language, such as the c-cedilla letter in French. Some common languages, such as French and Spanish, are installed on the Gear S2 by default, but if your desired language isn’t included on your watch, tap that language’s name and Samsung will automatically install it on your smartwatch. If you’ve filled your Gear S2 with a lot of apps and other data that take up much of your memory, you may not be able to download a new language. In that case, you need to decide what to remove from your Gear S2 to provide enough room for your new language. 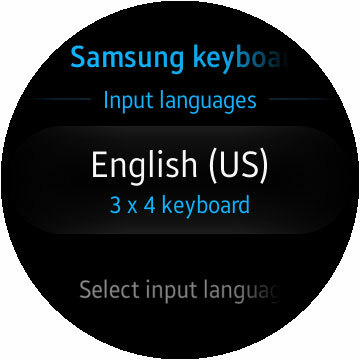 This option enables you to access the Samsung website and retrieve language files that Samsung has developed recently so that you can use one of these new languages on the Gear S2. Turn predictive text on and off. Predictive text is on by default and recommends words that the Gear S2 thinks you’re trying to type so that you can save some time. Be aware that predictive text can lead to the dreaded autocorrect failures whereby you send someone unintentionally confusing or hilarious text (and perhaps have it become an Internet meme). Turn personalized data on and off. Personalized data, which is on by default, is data you enter that the Gear S2 remembers, such as the spelling of your name. Change the auto-replace text language. You use this option to correct spelling for words in your preferred language. Turn auto-capitalize, auto spacing, and auto punctuation on or off. All these features, which are on by default, enable your Gear S2 to automatically fix any problems with capitalization, spacing between words, and punctuation. If you want to feel the Gear S2 vibrate every time you tap a keyboard key, tap Vibration in the Key-Tap Feedback screen. Tap this option to reset all keyboard settings except for downloaded languages. In the Reset Settings screen, you reset the settings by tapping the blue Confirm icon (it has a check mark in it) on the right side of the screen. If you change your mind, tap the Cancel icon (it has an X in it) on the left side of the screen.